You can follow us on HowToEngineering.com (just click on Business category). You can also follow us on our Facebook and Twitter accounts to see upcoming and past events! Our business is located in Los Angeles county, so we are following Local laws. They ask how much money you will make (suggestion – enter a LOW amount!) They will tax you based on this estimate, and if too high, they will tax you now! They also want me to get a permit for each location I will be selling at. I already had a list of all the swap meet and flea markets in my area, so I entered my name with their addresses. I need to use the selling locations address for the permits. The permit was approved quickly and was available to print in under 24 hours for us. The BOE (Board of Equalization) is who you will be paying the sales tax to. They will let you know how often you pay, could by monthly or yearly. They are also the ones providing the sales permits and re-seller permits. 2 – Next we gather items to sell. We went around the house and picked items we no longer needed or wanted. I asked family and friends and we now have a good supply of items to sell. We both went over all the items and picked out how much we wanted to charge for each item. Other sources for products are Thrift stores, estate sales, garage sales, attics, storage room auctions, pawn shops, etc. FIND DEALS! You need to profit on these items! Newspapers for customers to wrap glass/delicate products. We applied for a credit card reader for the phone, for when someone wants to pay with their debit or credit cards. I also made a briefcase for the swap meets that has: Pens, Markers, Credit card reader for phone, receipt paper, screw drivers, headache pills, my permits and sales log. I decided to make forms for my company, so we can track swap meet locations and rules, and track our sales and data. I made the Swap meet daily sales log to Log all sales by time and amount, but also log the cash at the start of the day (the change I bring) and the cash at the end of the day, so I can subtract for net profit, as a double-check for the total sales of items listed. The Swap meet location information sheet shows all the information about that swap meet location, useful for each time I want to sell there, I know who to contact and what their rules are. I keep this form with my permit for each location. Make sure to keep all receipts and keep track of money going in and out of the business. 4 – This step is setting up the canopy, tables, and laying out your items as a test. Time how long it takes to set up and get an idea how you want to lay your items out. Organize all items by categories so customers find what they want quickly. Get a view from the customer side and make sure all items are visible. Lay the larger items in the back and the smaller items closer to your customers. If you have small items you are worried for thieves, then you can use a display cabinet. It’s a good idea to take a few pictures of your setup. 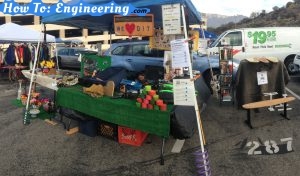 You can use that for your first marketing, or maybe the swap meet will want to see your setup. This was just a test setup, We have since changed the layout a lot!!! At this point I noticed we needed a sign. 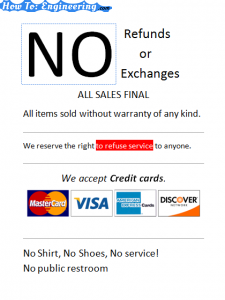 I made a sign to show that we do not accept refunds or exchanges. Place name, Address, Website, Contact name, email, phone. Event dates and times for public and vendors. Price and booth sizes and locations from parking lots. Where the vendors have to be parked (usually in the booth you rent). Rules and information about the location – (No food/drinks, arrive after ___am and lose your space, vending restrictions etc. 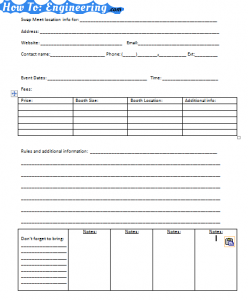 We added all this information to the form I made, Swap meet location information. Next is to sign up for a swap meet space. Look on their website and contact or visit their office. Show them your permits and information, fill out their forms, then pay the fees. 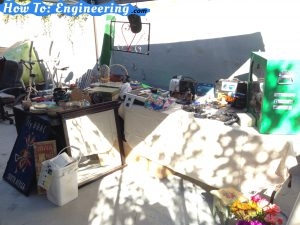 They may ask for the type of items you are selling and where you would like your space at the swap meet. Some swap meets are very crowded and you may not even get a space the day of the event. Its best to register early (you often pay less) and they usually tell you where your space will be at so you can promote yourself online. 6- Now that you know you will be at the swap meet, Tell your friends and family! Tell your Facebook/twitter friends, tell everyone! OK, don’t harass them with it, but let people know your starting a swap meet business and you will be at that location. You can follow us for more ideas! 7- Plan to be at the swap meet early!!! You may need to arrive 2-3 hours before the general public arrives. Its takes time to set up a booth and you do not want to be distracted setting up when there are customers there. Setup your booth starting with the canopy then the tables. Add some table cloths and you can lay out your items. Crates then go under the tables (hidden by the table cloth covers). Smaller items facing your customers and larger items towards the back of the booth. You want the most visibility for the people walking down the aisle to see something interesting and walk over to your booth. You should move your items every hour or so to attract attention. Customers will often see you at your booth looking at items and it will interest them. It will also increase the visibility of unsold items and will fill in spaces where items have sold. When a customer starts looking at an item for a while, Its a good idea to talk with them and ask if they are interested, tell them the price or ask them to make an offer. I noticed by doing this I increased the chance of a sale by a lot! Take notes throughout the day. 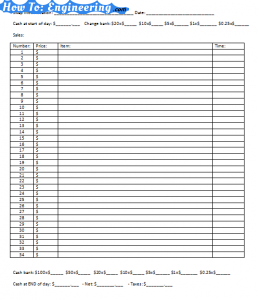 Log all sales, write the amounts, items and time sold. You will use this for taxes and to study what sales and what times are the best, etc. Also take notes on the items people are asking for!!!! This will help you when you are restocking and need more merchandise. I log this information on my Swap Meet daily sales log. Good luck to everyone starting a new business! Its a lot of work but very exciting and rewarding. Keep researching and learning! I will keep updating as I learn new information!